Florida lawmakers are worried that the monopoly they’ve long empowered the Seminole Tribe with will come back to haunt them. The State of Florida has long entangled with the Seminole Tribe via negotiations. In fact, the State Government would accept $343 million in direct cash flow annually from the Tribe in exchange for suppressing and limiting of other non-tribal gaming activity and promoting specific gaming forms in the Sunshine State. However, this deal is set to expire in May of 2019, and Florida legislators are unsure if the tribe will be able to renew, and continue their annual monetary contribution. Many lawmakers are concerned due to recent annual contribution adjustments by the Tribe based on lower than usual annual profits and net gains. However, this shouldn’t be the State Legislature’s only concern. The Seminole Tribe partnered with Disney and formed a PAC called “Voters in Charge” to promote the passing of a Constitutional Amendment during the 2018 State Election. This State Constitutional Amendment would strip the State Legislature of powers which could alter gaming in the state and put that power solely in the hands of Floridian voters. This Amendment sponsored by the Seminole Tribe was passed, meaning any future change to Florida’s gaming industry must receive a 60% majority approval by voters. One could say the Tribe was running the long-game, creating a monopoly for years by being the sole form of gambling entertainment and then sealing their fate with trading gaming power from politicians to voters. The Tribe’s ease of manipulating people’s view of their Constitutional Amendment during the 2018 Election via radio, television, and internet ads does not sit well with those concerned about getting a majority of voters to approve of expanded forms of gambling. Disney has their own motive behind supporting “Voters in Charge” as they were worried about industry cannibalization. Many other US states have proposed legislation to introduce new entertainment venues which include online gambling, sports gambling, and so on. Disney did not want any added competition and is comfortable sharing the current Florida entertainment sphere with the Seminole Tribe, so they supported legislation limiting the State’s powers to determine future entertainment industries entering the domestic market. Several lawmakers are concerned about how the uncertainty over tribal gaming funds will affect proposed budgets for the state. Due to a large amount of the budget, the Seminole Tribe’s annual exchange provides, the estimated $842 million plus in total revenue could fall drastically without their regular revenue contribution. State Representative Randy Fine says, “We are still forming policy goals for gambling and as we are in this legal limbo with the Seminoles, we need to think about the resolution we want”. Fine is also eyeing sports gambling but did not share specifics on how to introduce and implement this expanded gambling form or whether this will conflict with the new Constitutional Amendment passed. 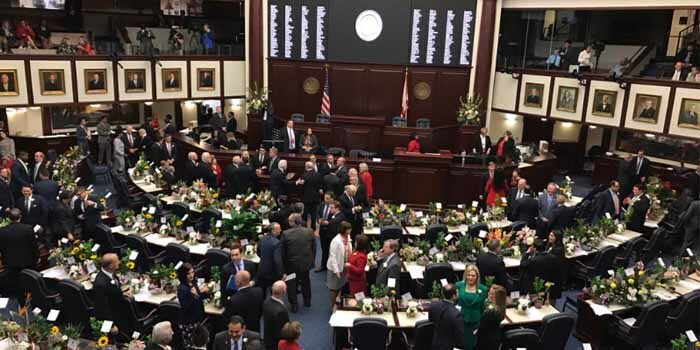 The current climate in the Florida legislature is unsettling and lawmakers are surely suppressing their panic, as a large part of their forecasted 2019 budget could be slashed. State legislators are scrambling to introduce legislation to remedy the situation either for new revenue sources or to mend the State’s Tribal Gaming Compact. An outcome, unable to be foreseen as of the time of this writing.